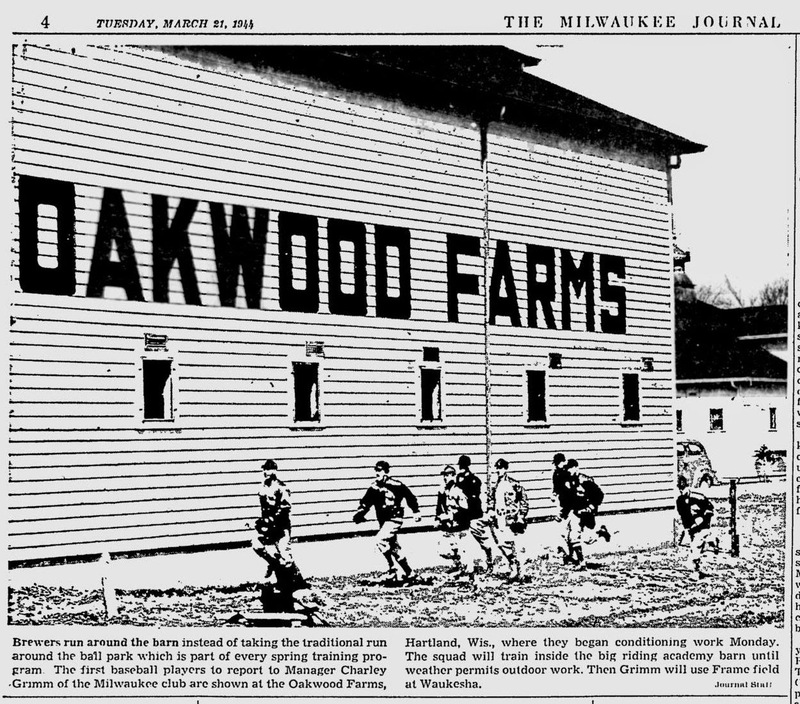 Brewers run around the barn instead of taking the traditional run around the ball park which is part of every spring training program. 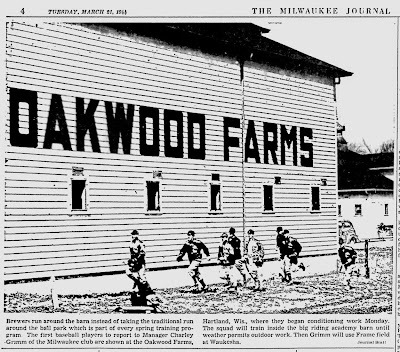 The first baseball players to report to Manager Charley Grimm of the Milwaukee club are shown at the Oakwood Farms, Hartland, Wis., where they began conditioning work Monday. The squad will train inside the big riding academy barn until weather permits outdoor work. Then Grimm will use Frame field at Waukesha. 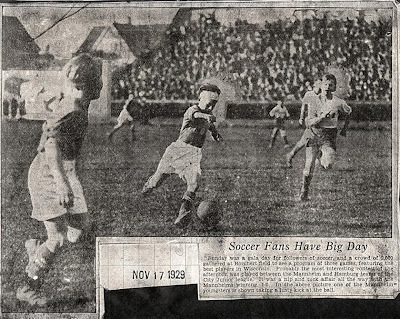 As Major League Soccer enters the second week of its 2014 season, we take a look at youth soccer being held at Borchert Field on November 17, 1929. Sunday was a gala day for followers of soccer, and a crowd of 2,000 gathered at Borchert field to see a program of three games, featuring the best players in Wisconsin. Probably the most interesting contest of the afternoon was played between the Mannheim and Hamburg teams of the City Junior league. It was a nip and tuck affair all the way with the Mannheims winning, 1-0. In the above picture one of the Mannheim youngsters is shown taking a lusty kick at the ball. Milwaukee has a long soccer history, much of it played on the grass of the Brewers' baseball park. I can even tell you that Milwaukee Brewers slugger Gorman Thomas originally wore #44 but had to give it up when Hank Aaron joined the team in 1975. Gorman had to settle for #20, his high school number. All of these players are easily recognizable. Even if they are current players, a player's number is the first thing our minds seize upon and for the most part, they hold onto that number for their entire career. 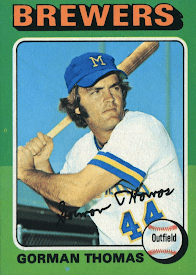 But when I tried to identify who wore a certain American Association uniform number, it came as a big surprise to this author that those waters are a lot murkier and uncertain. 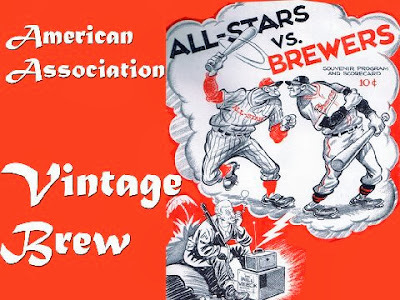 As a collector/historian of the American Association's Milwaukee Brewers, this has always been an intriguing bit of research whenever I encounter a new uniform. Who did it belong to? Many times, I just can't be sure. While the big leaguers are well documented and published in various books and databases, the minors can be a major problem. The easiest way for me to illustrate this is by going back a few years and re-examining a 1949 Milwaukee Brewers jersey that was first offered on eBay in 2004. 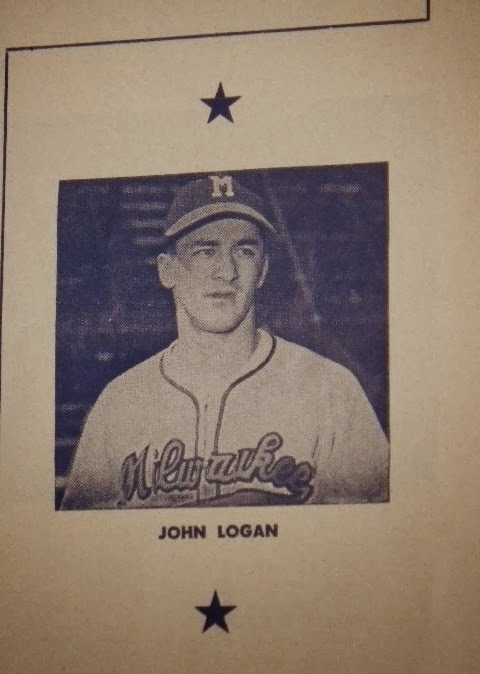 The jersey was identified as belonging to Johnny Logan, the Milwaukee Braves' scrappy all-star shortstop. 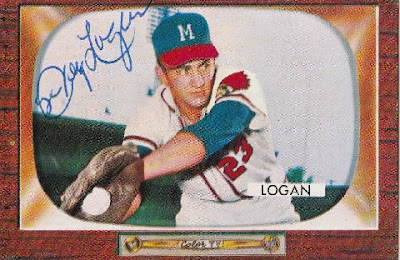 Logan was a member of the 1957 World Series championship team and was with the Milwaukee Braves from their beginnings in 1953 through 1961. Prior to his time with the Braves (Boston and Milwaukee), Johnny played several seasons with the American Association Milwaukee Brewers, including 1949. I had a chance to purchase the above mentioned 1949 jersey a few years later. It was a very exciting prospect to lay hands on what very well could be, an important piece of Milwaukee baseball history. Was I interested? You bet! It is important to note that I inspected this uniform in person. I did not have to rely on the old pictures provided by Ebay. having missed the auction. Its new owner was a knowledgeable local collector/dealer, who dealt with game used equipment on a regular basis. Let's investigate! 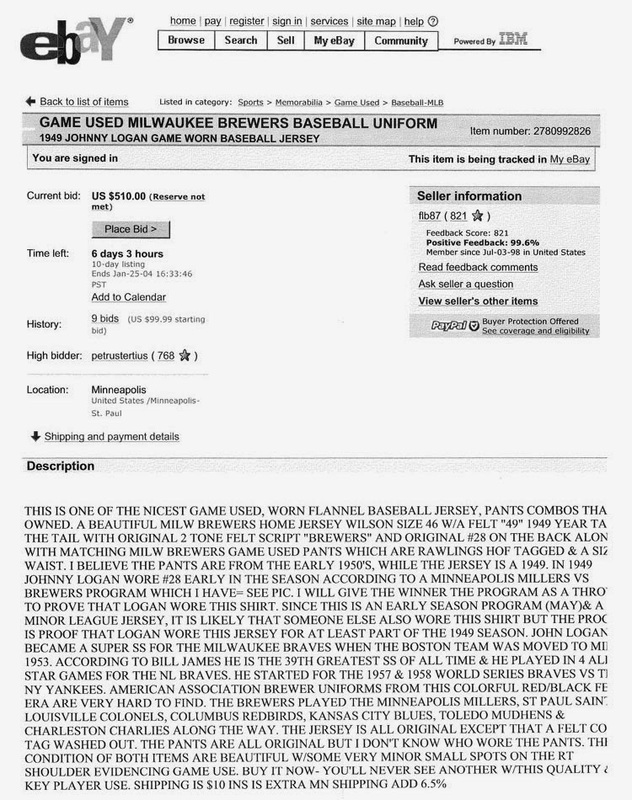 *Borchert Field's Chance Michaels saw and fortunately saved the original eBay listing. The description and photos showed both the jersey and pants, showing the tagging, size, photos of its front and back. 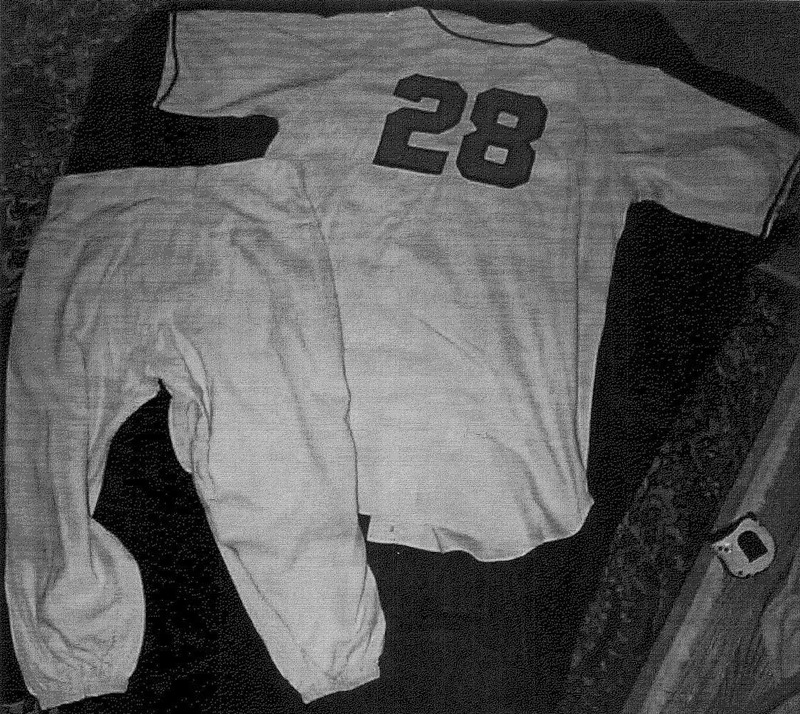 The jersey was numbered #28 and included photos of jersey and pants. The clearly dated 19(49) jersey was manufactured by Wilson while the pants, described as from another year were made by Rawlings. As the pants were a mismatch, I exclude them from this evaluation. The present owner felt they could have even belonged to the Milwaukee Braves, if my memory is accurate. The eBay seller had stated that this jersey was worn by Milwaukee Braves star Johnny Logan for at least part of the season. 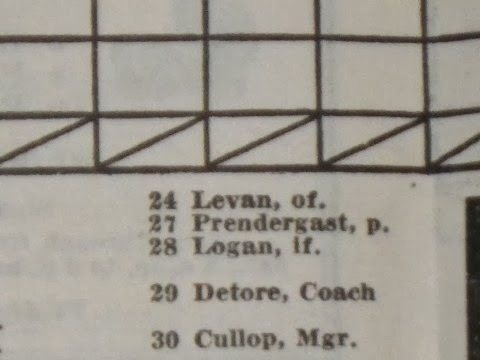 Citing a program pictured for evidence, including the scorecard, had Logan wearing #28. Based upon the present owner's knowledge of game worn equipment and this evidence, he decided to purchase the uniform. 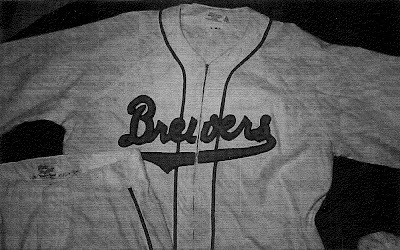 This author was shown the jersey in 2005 and again in 2006 while negotiating a possible purchase of this Logan Jersey and of another Brewer uniform, a 1950 Milwaukee Brewers Home jersey. The #28 jersey was a cream colored home jersey used by the minor league Milwaukee Brewers with the 1942-49 small-e "Brewers" script across the front (as opposed to the Braves-style Greek-e worn from 1950-52). It was clearly a 1949 issue as the number 49 was sewn in. There was no indication (either tagged or written) as to who may have used the jersey, which is not unheard of. As stated earlier, major league player numbers are pretty well documented and we are usually able to follow them with minimal effort, not so in the minors. Team and league changes happened all the time as a player worked his way up (and sometimes, down) the minor league ladder. A player did not have (much of) a say in choosing his number. Players didn't even wear the same numbers from year to year even if they did stay with the same team. 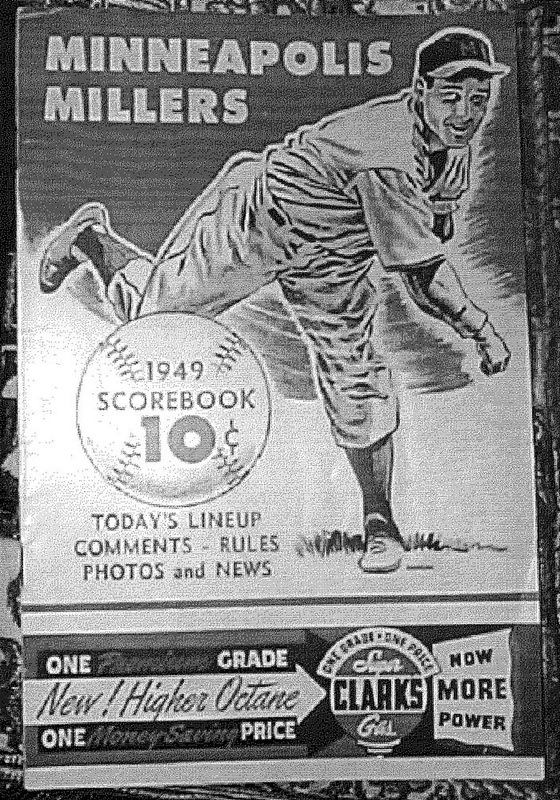 A good example of this would be Ted Gullic who played with Milwaukee in 1931-32, 1934-42. He had several numbers over the 11 years he played with the team. 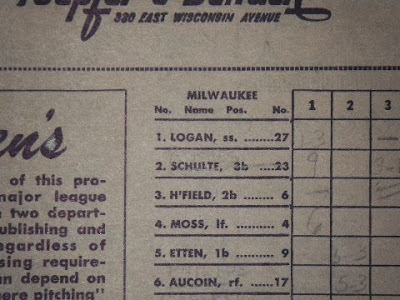 First on my list of things to check was when did Logan play for the Brewers. 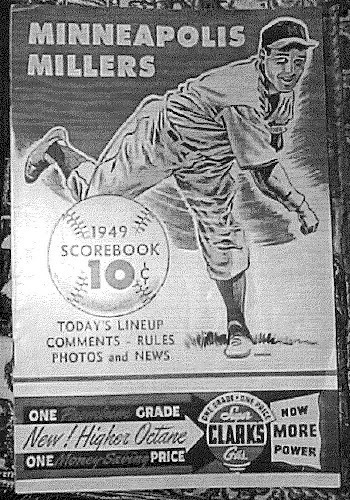 Sources confirm Johnny played for the Brewers in 1948, 1949, 1950 and 1951. Also important to check, was what if any time was spent at the major league level during those years or other minor league assignments. 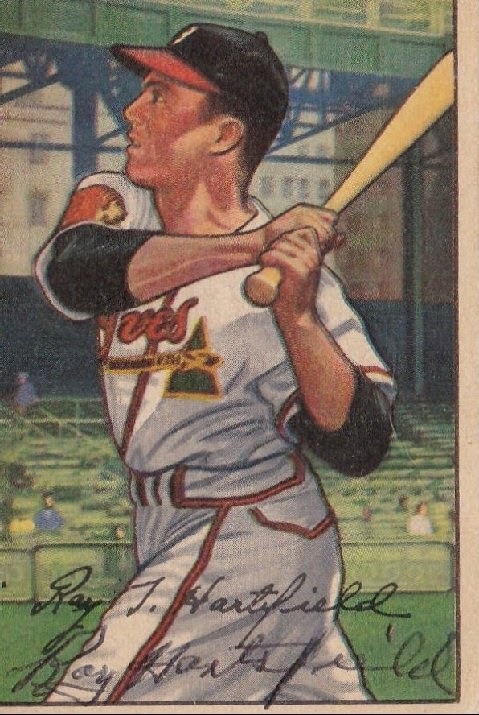 Johnny was called up to Boston (Braves) in 1951. 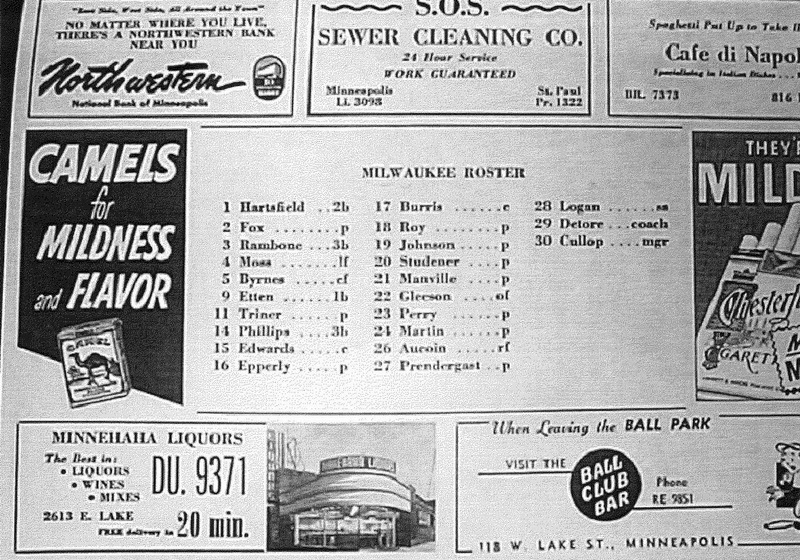 My next step was to check the programs available to confirm the claim that John wore #28 while in Milwaukee in 1949. 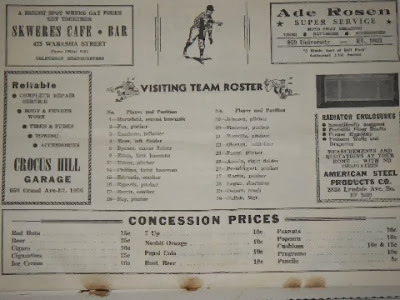 Newspapers are of little or no help, box scores and articles in newspapers seldom if ever show uniform numbers. Also scarce are photos of single players in action, captured just right, showing their numbers. I inspected all the 1949 programs I owned along with others at the Milwaukee Public Library and those of colleagues who also had copies. While I was at it, I did check all the home programs I had during his tenure with the Brews. In 1949, the only home jersey # that Johnny Logan wore was #27. Johnny played the entire season with the Brewers. so there wasn't any reason for a uniform number change to occur. Being unable to prove Logan wore this number at home was enough to make me balk at purchasing the #28 jersey. It was over twice the price of the 1950 that I did acquire and just not worth the risk without further proof to as to which player could have worn it. An attempt was made to have Johnny autograph this jersey by a 3rd party, but Logan refused, saying it was not his. While player memories often fail, this was another red flag. The mystery intrigued me, if not Logan, whose number was it and more importantly, what to do next to find out? A 2nd look at the home programs complicated matters as they showed no one assigned this number. originally, he had to have seen something to induce him to purchase. Just maybe, the proof would be found elsewhere. I began a search to find a road program, to see if I could get an answer there. Road programs are many times scarcer than home programs. 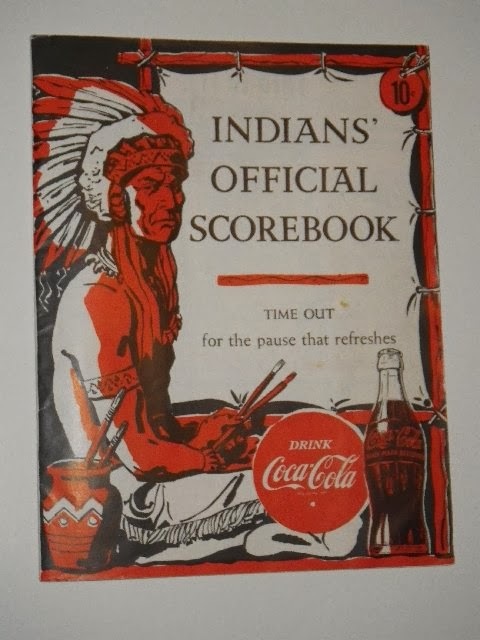 It took me awhile, a couple of years in fact, but I finally found an Indianapolis Indians vs Milwaukee program for 1949. I had the proof that he wore that number, but it was the wrong answer. When it came to authenticating this jersey as being John Logan's, it was a horse (uniform) of a different color. The Brewers wore different road uniforms and the #28 in question, was definitely a home jersey, not a road jersey. This program's revelation yielded another totally unexpected mystery. Why did Logan wear a different number on the road? 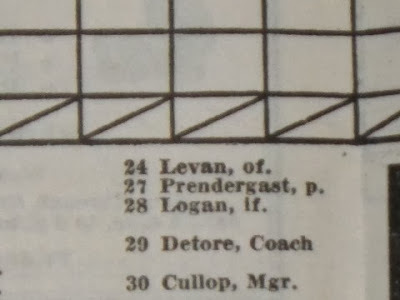 I inspected other home and road programs from the 30's and 40's in my collection and found that it was the norm, as in the major leagues, for teams to use the same numbers on the road. For some reason, some players wore different numbers on the road in 1949! Besides Johnny wearing a home #27 and a road #28. 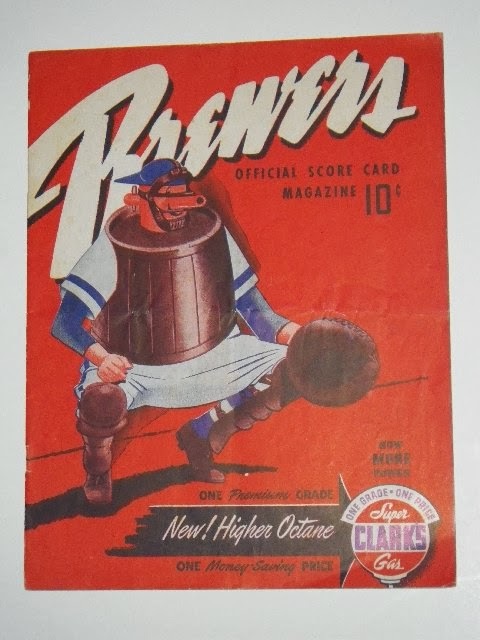 As I noted earlier, Johnny spent the entire season with Milwaukee, there was no reason or opportunity to change numbers, on the road, Brews pitcher, Jim Prendergast wore #27 during this game in Indianapolis. 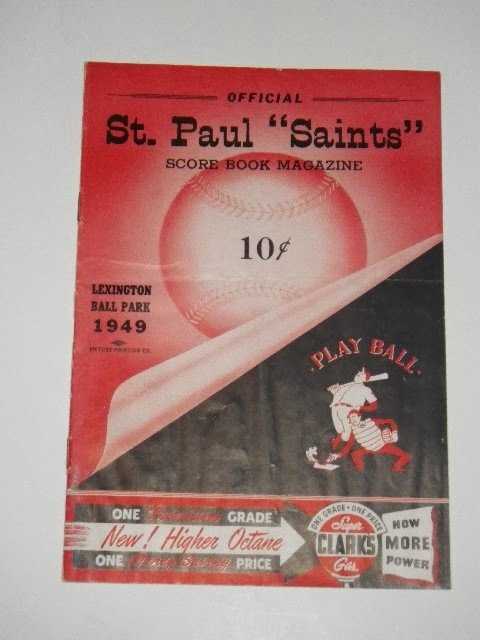 I found another, a Saint Paul Saints program that confirmed, that it just wasn't a fluke in Indianapolis. It wasn't just Logan, a glance at the scorecard showed that other players did the same thing. 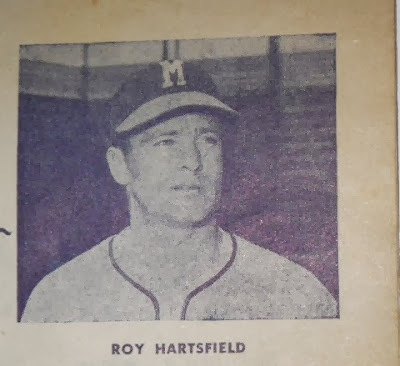 Another example is Milwaukee Brewer Roy Hartsfield who wore #6 at home and #1 on the road. 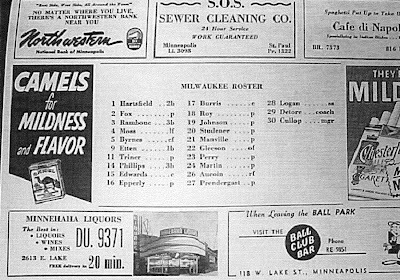 Important to note, like Logan, Hartsfield played the entire season in Milwaukee. There would be no reason for him to change numbers either. 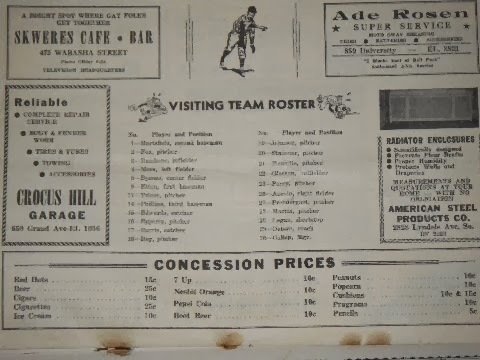 A closer look, comparing the 1949 home vs. road rosters shows that half the team wore the same numbers on the road, while the other half had different numbers. Thanks to Chance (Michaels, not fate) that the lost program has been found. 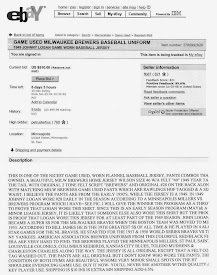 Seen below from the original eBay listing. The proof, though, was that the program showing Johnny using #28 was indeed a road program from Minneapolis. I am convinced there was no intent to misrepresent this jersey by its original seller in 2004. I may have made the same conclusion with what was known at the time. This uniform "study" speaks to the need for research to continue for programs/ scorecards both at home and on the road and for it to be shared. It is my desire by this example that researchers and collectors who read this, begin to pool their collections of scorecards and join us to do a data base on player numbers. A big thank you to Abbott and Costello for summing up in parody, what makes baseball research so interesting.